The images that helicopter pilot Steven Bruce Bokan has published on Facebook confirm Tamara’s impression: They show a deeply snow-covered campground. 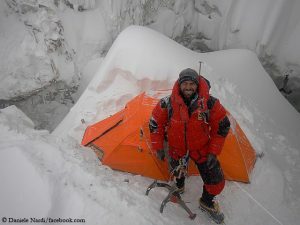 The duo from Italy is planning not only to climb the 8167-meter high main summit of Manaslu, but also in one push the 7992-meter-high Pinnacle East. 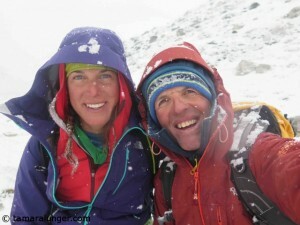 Initially it was scheduled as a winter ascent, now it has become an early spring project. 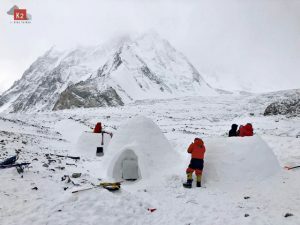 In the meantime, the 28-year-old Tamara and the 47-year-old Simone kept themselves fit in the Khumbu region for the past three weeks. 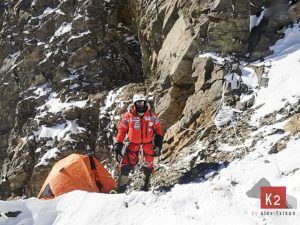 By their own account, they climbed 6189-meter-high Island Peak twice within 48 hours: first on the normal route, as the first team this season, then on a new route to the East Summit. They are well acclimatized now. 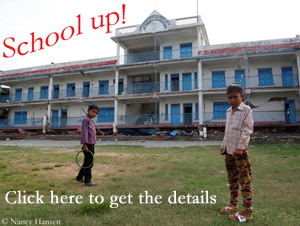 That should be no reason to stop them on Manaslu. But will the “Mountain of the Spirit” be more gracious with them this time?